New study reveals that microbes that live in the deep sea are true scavengers. A paper released today in Nature Communications explains how microbiologist and oceanographers used genetics to figure out what dominant ocean microorganisms are eating. The scientists from the University of Michigan and The University of Texas (Brett Baker and Chip Brier) looked at five different groups called Archaea from deep sea depths ranging from 0.5 to over 3 miles deep. The majority of the microbes were actively consuming many different types of food from proteins to carbohydrates to fatty acids. This new finding has large implications and will allow scientists to better understand how carbon is recycled on the planet. 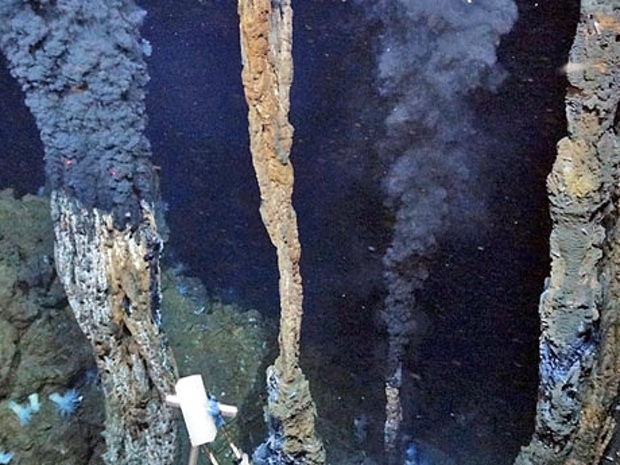 Researchers looked at microbes in hydrothermal vent plumes, like the one pictured from the Cayman Trough, and pelagic background seawater across three different ocean basins. Credit: NERC Jon Copley.